Local Name (Japan): Tanchō (タンチョウ) - "Red-cap"
The Red-Crowned or Japanese Crane is without a doubt the most iconic bird of Japan. 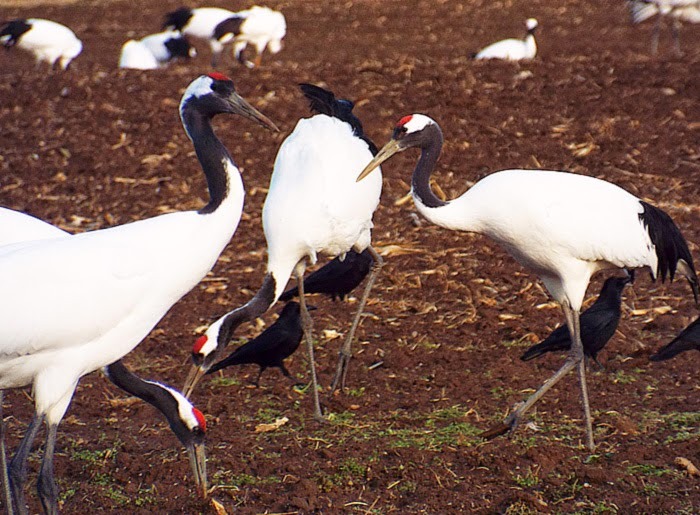 There are actually six species of regularly occurring crane in Japan, but the Red-Crowned Crane is the largest and the only species to be resident in the country. This was a close thing - at one point it was considered extinct in Japan, and it wasn't until a small group was found and started being fed and protected that their numbers rebounded. They can now be seen in various places across Eastern Hokkaido, but the greatest congregation of feeding sites is in the Kushiro Marsh area. I saw these at the Akan International Crane Center, which apparently has the closest views of the major feeding sites, though my first sighting was actually of a small flock from the main road near the airport! - TOKYO/HOKKAIDO 2014 TRIP: Numerous at Akan Crane Centre (around 40-50 individuals) plus three seen en-route near Kushiro Airport.